A giraffe print adds a playful, wild touch to a room's decor, whether painting a desktop, an art canvas or even an entire dresser. Creating the print requires no templates or stencils -- free-form spots give the print a more random and natural look, much like on an actual giraffe. While the pattern can be painted on just about any surface, use a primer or paint designed for the material at hand; standard household primer may not adhere properly to plastic, for instance. 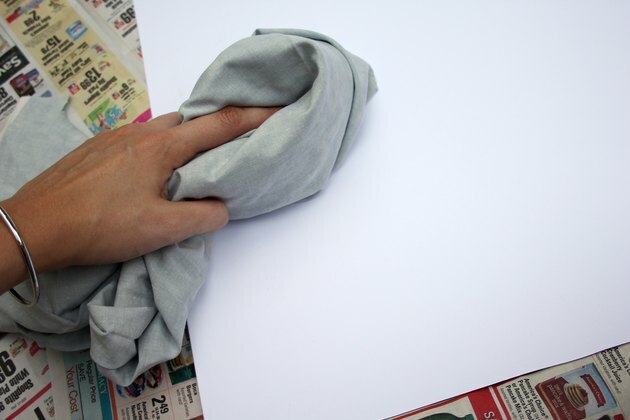 Wipe the object or wall down thoroughly with a soft cloth to remove dust. If the project surface is dirty, clean it with an appropriate household cleaner and a soft cloth. 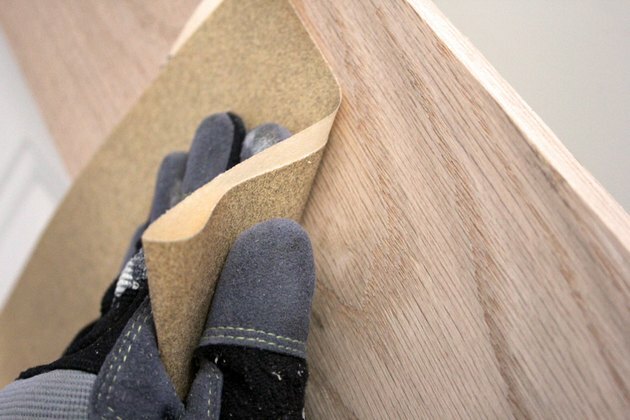 Sand the project area with fine-grit sandpaper if working on a surface such as a piece of furniture or small wooden craft object. Sanding also scuffs up laminate furniture and plastics, making the surface more receptive to primer. Wipe the dust away with a soft cloth. Skip this step if painting a wall. Cover any areas you don't wish to paint with painter's tape. 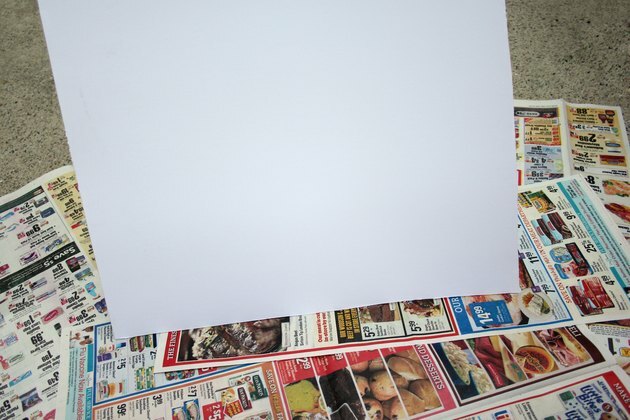 Place a small project piece atop newspaper, or place newspaper on the ground in front of an area such as a wall to catch stray paint splatter. Pour some of the primer into a paint tray for a large project, or a small, disposable container for a small project area. Acrylic or latex primer may be used for a small object; latex primer is more cost-effective for large areas. If painting plastic or metal, use a primer designed for plastic or metal. 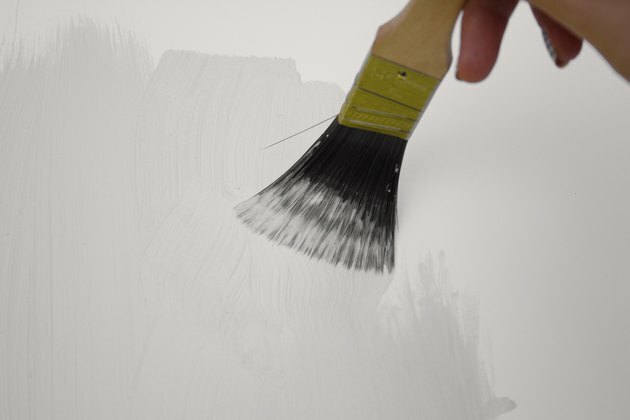 Coat the project area thoroughly with primer using a paintbrush, allowing the primer to dry thoroughly. Apply a second coat if the original object color is still visible; allow it to dry as well. 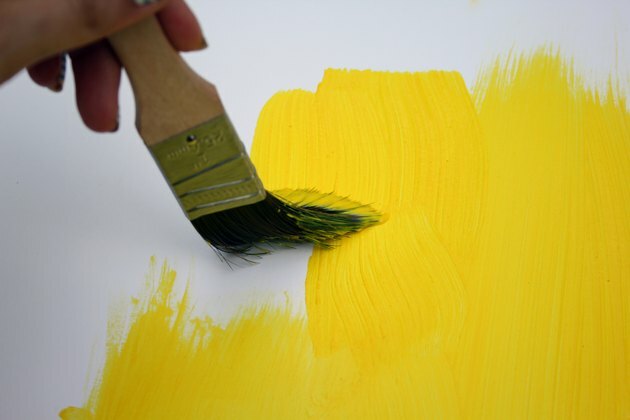 Apply a coat of white, yellow or tan paint over the entire project area with a paintbrush after pouring some of the paint in a paint tray or shallow container. 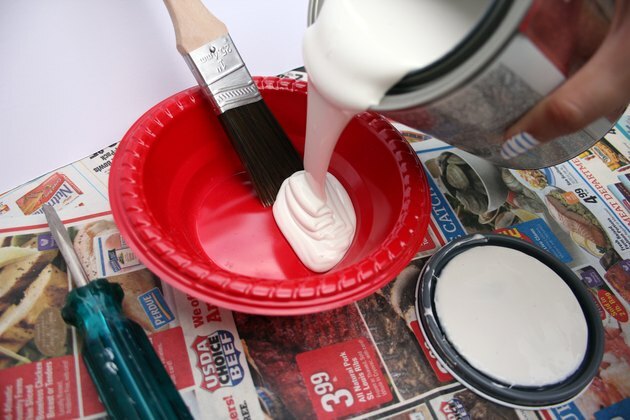 Apply a second coat over the first, if necessary, allowing paint to dry completely after each coat. 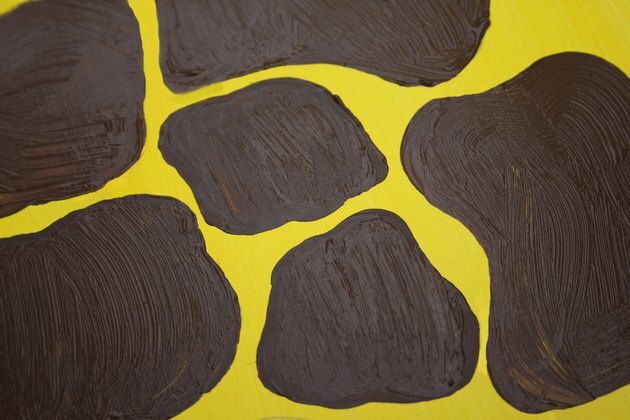 This is the base color for the giraffe. 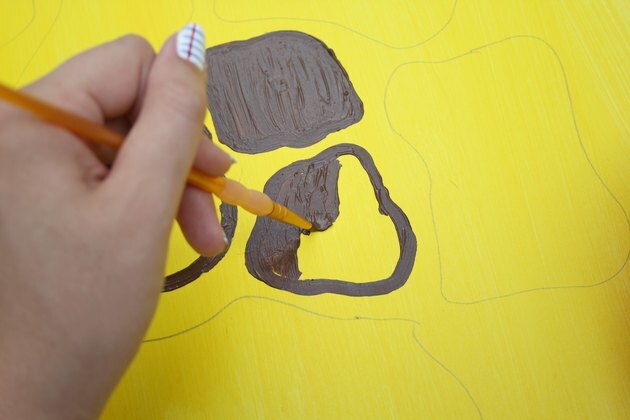 Draw random blob- or amoebalike shapes on the painted surface with chalk or a pencil, keeping the shapes near one another so just a bit of the base color shows between each spot. Redraw any shapes as desired. Pour some of the brown paint into a shallow container. 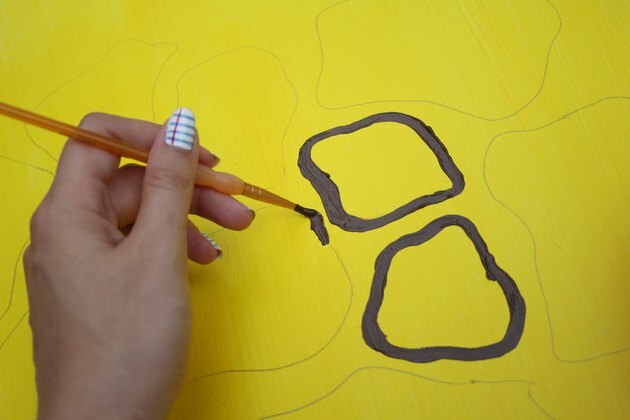 Dip a fine artist's brush into the paint and go over the outline of each giraffe spot to create a neat outline for each spot. 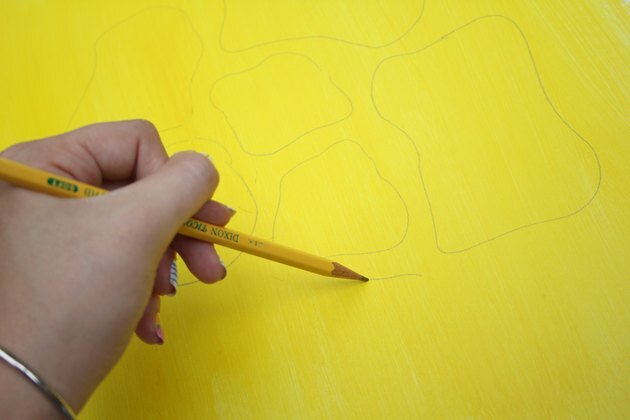 Make the outlines as thick as you'd like; this will make it easier to fill in the spots with a larger brush. Fill in the spots with a regular paintbrush for large areas, or continue using artist's brushes for smaller surfaces such as picture frames.